Objective statement: In one or two sentences describe the type of position you are looking for. Skills: You should focus on skills you have that the position you are applying for requires. ER nurses are continually upgrading their skill set and adding certifications, so it is easier for those with experience to target skills needed with skills they have. However, even newer ER nurses will have relevant skills for many positions. The relevant skills you list should be included using bullet lists so that they stand out. Formal qualifications and certifications: Provide the details of your nursing degree/degrees (school name, date graduated, degree received). Your nursing license, Emergency Room Nursing Certification, BCLS and CPR certifications and any other relevant certifications should be listed also. The skills section is where the most important information will be. All applicants will have similar certifications and education. Employers will be looking for those who possess relevant ER skills, so by targeting specific skills and highlighting them in the emergency nursing resume you will be an applicant to consider seriously. If you need more examples of proper styling, look at this finest pediatric nurse resume now! Have you avoided big blocks of text in the resume? Did you use bullet lists and other highlighting techniques to make the most important information stand out? Did you include all the certifications you intended to and verify the details? Mark off items as you verify them to avoid unnecessary repetition. The checklist helps keep you organized and ensures that the resume you submit is as good as you can make it. The Bureau of Labor Statistics doesn’t separate ER nurses from other RNs. ER nurse salaries for the most part are very close to those of other RNs and you can get a fairly accurate idea of your income potential as an ER nurse from the figures provided for all RNs. The median wage for a RN is $69,790 or $33.55 per hour. The best paid ten percent of registered nurses make over $96,000 annually while the bottom ten percent earn around $45,000. Employment of ER nurses is projected to grow 19 percent over the next 10 years which is well above the average for all occupations and about the same as other RNs. 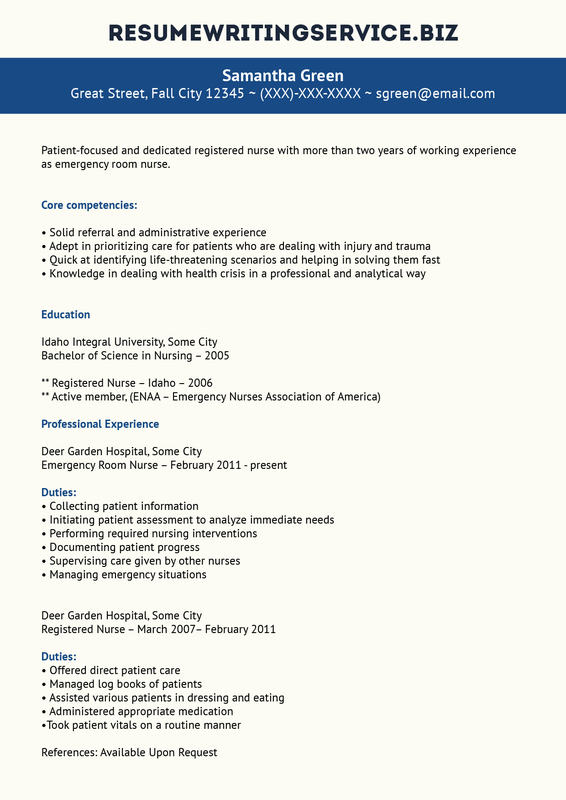 If you are looking for more templates, then you might like our critical care nurse resume sample. Review it now! For a remarkable ER nurse resume writing, get in touch with our team today!